Boston, MA hosted this year’s House of Delegates and NEXT Annual Conference: The Illinois Delegation, along with IPTA staff members Colleen Flannery and Matthew Nicholas, listened as APTA President Sharon Dunn, PT, PhD shared new, bold goals for the association, including moving the APTA to new headquarters in Potomac Yard, a rapidly expanding residential, retail, and office area less than 2 miles from the current APTA offices near Old Town Alexandria, Virginia. The current APTA home was built in 1983, when the association was considerably smaller and workplace needs were different. Construction on the new offices is anticipated to be completed in 2021 in time for the celebration of APTA's centennial. 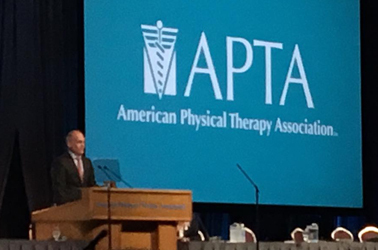 President Dunn used “Better Together” to describe the culture of engagement and collaboration that APTA is working to create through new initiatives, including enhanced relationships with other groups. One example is collaboration with Move Together, an organization founded by IPTA’s former early career board liaison, Efosa Guobadia, PT, DPT, and former APTA Student Assembly President, Josh D’Angelo, PT, DPT. APTA CEO Justin Moore, PT, also addressed the House of Delegates and took the opportunity to promote Shoes4Kids and the dedicated efforts of Brad Thuringer, PTA, a South Dakota member of APTA who has spearheaded the efforts of supporting this cause each year as part of APTA’s House of Delegates and NEXT Conference. Both Dunn and Moore spoke extensively of a series of “bold moves” that the APTA intends to take on as the association approaches its 100th anniversary in 2021, but the first order of business to be addressed by the House was to lay the groundwork for development and adoption of a new mission for the APTA that aligns with the current vision that was adopted by the House in 2014. Dunn stated, “We are in a unique moment in our history to take on these challenges. Clearly, we have a vision that supports this kind of thinking, and we have developed a culture of engagement and collaboration. We are better together—and together, it's time to act." 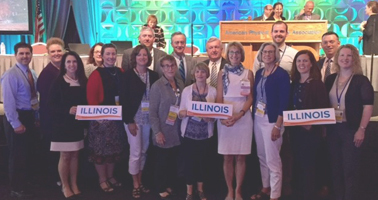 Thank you to all of our Delegates who were able to travel and represent Illinois in Boston, MA for APTA's 2017 House of Delegates meeting. Your time, skills, and energy are much appreciated by the association.